I’m sure they will, but when they release the soundtrack to the show, I hope they include the piano song from the start of the episode. Not the them song, but the song used during the flashback scenes. I’ve only bought one show soundtrack based on one song that I liked. It was the soundtrack for the first season of current Battlestar Galactica and the song was “The Shape of Things to Come” by Bear McCreary. It was the final song of the last episode for that season. Much like “The Shape of Things to Come”, that piano song (I wish I know what it was called) during the flashback scenes is very pleasant to listen to. There really isn’t much to say about this episode as its the start of a new arc. I liked the balcony discussion between Ayu and Yuuichi. 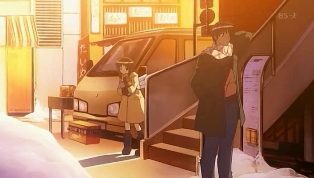 I found it rather ominous in way, that neither could remember the day that Yuuichi gave her the headband (and I suspect that its going to be either then headband or the angel doll that she’s looking for). The flashback scene later in the episode just reinforces it for me. 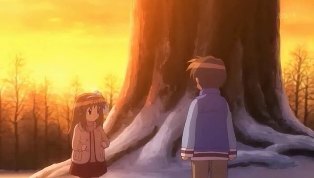 I have to ask, just how did little Ayu climb that huge tree when there weren’t any lower branches to climb up on. Just how did she climb that tree? Ayu and Yuuichi meeting up at the bench to do another search for Ayu’s lost item made a nice circle tying in their childhood to their present. After all, that’s bench seems to be the catalyst for the two opening up to each other. 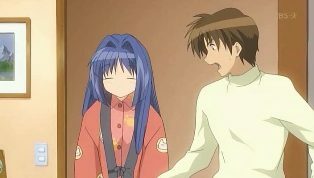 In earlier episodes, we see that Ayu telling Yuuichi about the loss of her mother and in the final moments, the two open up about the losses they have had. And the bench served as a catalyst for a kiss. Yeah, about that kiss. It looked nice. But then I’m mean so I didn’t really get any sense of romance from it. I don’t know. 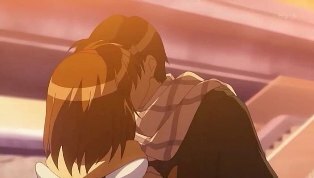 The kiss between Haruhi and Kyon made more sense to be, but then Kyon was out to save his life the world then anything more romantic. 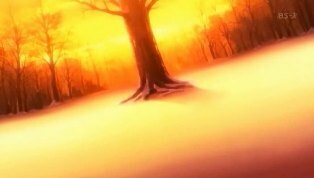 About that tree…If you go all the way back to episode #1, the first scene after the OP shows what appears to be little Yuuichi crying over little Ayu. 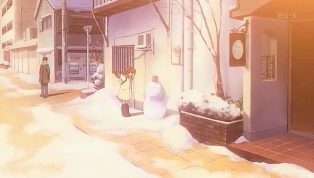 There is some mention of “red snow” if I recall correctly. The scene seems to be set at that tree. I half expected her to fall off the branch during that climbing-tree scene. Also, I’ve been wondering about the connection between the angel doll and the backpack. You know, like is there one? The head band is red, and that just sets off some type of otaku ESP when I thought about it. Why doesn’t Ayu have a school uniform? Does she? Apparently, her school is in a forest somewhere? Now, I’ve been assured that they’re not going to kill off Ayu, but it’s different if she’s already dead, like a ghost or something. Is this entire story Ayu’s dream? I expected Ayu to fall also. I had forgotten about the tree from that episode. And there was a mention that alludes to that tree in the preview of the next episode, so I’m hoping that things will get rolling. I forgot about the wings on her backpack too. I suspect that I had just gotten used to them. Plus the focus has been on the doll and now on her headband. 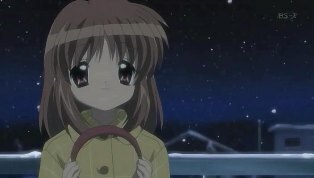 If Ayu does go to school, then it could be some sort of alternative school. But I don’t think she does. I don’t think she’s dead either. In the earlier episodes, when she left the scenes the direction she went off into always seemed to have bright light coming from it. I guess some portion of this show has to be a dream if you think about what is said in the voice overs at the beginning of some episodes. Either that or some sort of trapped consciousness.